Am I boring u with my 'learning to bake' process? :P Hope not boy! :) 'Cuz more will be coming up. I love butter. Anything buttery & cheesy, I would never be able to resist especially cakes. 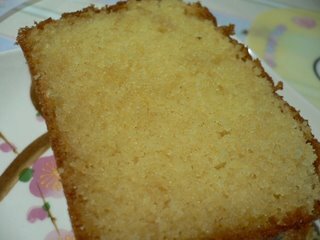 Late afternoon today, baking mood came over me while I was sitting in front of my TV watching my TVB series. 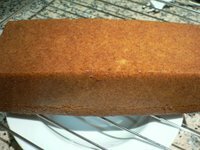 I stopped what I was doing, went to surf the net hoping to find easy & fuss-free baking recipes. Not in the mood for washing lots of stuffs, glad I managed to find one that suits my request & ingredients I have in my fridge. Wanna say a big "Thank You" to Edith. Thanks for posting this recipe on ur blog. I had fun baking today. Hubby gave thumbs up for this Butter Cup Cake. Of course, hiccups never fails to happen for a beginner like me. I was happily beating the butter till I saw some oil appearing. Oh gosh! I read from somewhere that if this happens, things ain't going to look good. Sigh! :( Never gave up tho' I felt like it. I stopped beating, quickly did the following steps (thank God at this stage my butter was quite fluffy already). My brain was telling me sure fail, my heart was saying don't assume failure yet as u've not begin the most important part. Oke, so in the tin goes to the hot hot oven. I just love the smell and fragrance when the oven is starting to work while I rest. :) That's one of the "looking forward" encouragement that makes me wanna bake. Here's my final product. Verdict? 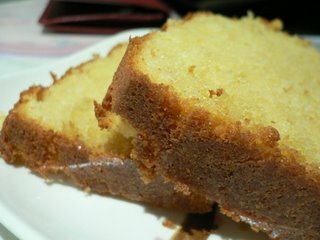 My beating of butter skills is better, and I baked it for a longer time so it would not be too moist in the inner part. The outer part is overbaked tho' I covered with an aluminium foil to prevent the top from burning but I'm glad I've improved & learned thru' this experience on how to beat the butter better.